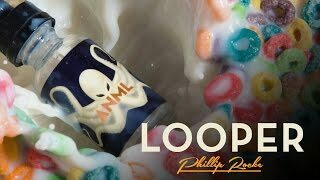 ANML Looper e-juice is an expertly crafted vape juice by world-renowned mixologist Phillip Rocke, promoting a remarkably accurate flavor of fruity cereal drenched with creamy milk. Looper has a complex, yet immediately familiar taste that perfectly balances the crispness of a newly-opened box of fruity cereal with the rich, indulgent flavor of fresh milk. Let your taste buds rejoice over this subtle Cereal vape juice, for it has been a long time coming.